Taste of Little Rock set new records this year, with nearly 800 people attending and more than $100,000 raised for student scholarships. Visitors were treated to tamales from Doe’s Eat Place, perfectly plated beef medallions with mashed potato from Arthur’s, melt-in-your-mouth sweets from Nothing Bundt Cakes, frozen treats from Le Pops and many other cuisines provided by this year’s 33 vendors. Samantha’s Tap Room and Wood Grill served a seafood pasta that won over the crowd and earned the restaurant the “Best of Taste” designation for the second year in a row. The event raised just over $100,000 for student scholarships. This year’s Taste of Little Rock paid tribute to Arkansas Heart Hospital CEO Bruce Murphy for his longtime support of UA Little Rock and his work to impact the health of Arkansans. Murphy, who graduated from UA Little Rock in 1975 with a Bachelor of Science, has been a longtime supporter of UA Little Rock. Last year, he gave $800,000 to the College of Education and Health Professions. 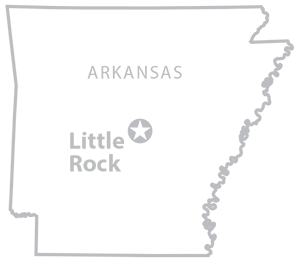 That gift helps support the Student Success Initiatives Fund, which provides academic tutoring and mentoring to students as well as a full-time social worker to assist students. On April 3, the night before Taste of the Little Rock, UA Little Rock hosted a small reception honoring Dr. Murphy. Sloan Davidson, director of the nursing department, told Dr. Murphy that her students have benefited tremendously from having access to a social worker. Nursing is UA Little Rock’s largest major, with more than 400 students enrolled in associate degree programs and another 400 in the Bachelor of Science in Nursing program. Davidson has had students who have dealt with the death of a spouse and a child. The Student Success Initiatives fund includes emergency funds that have been used to help students in desperate situations. “We’ve been able to help students renew their electricity and prevent them from being evicted. We’ve had homeless students we’ve been able to get housing for. It’s just been more than we could ever ask for, and we so appreciate it,” Davidson told Dr. Murphy. Those kinds of resources often mean the difference between students dropping out of school or finishing a degree that will help them get a job with which they can support themselves and their families. ‘“It’s also adding a nurse to our community, where we currently have a nursing shortage,” Davidson said. Murphy said he felt honored by his alma mater. 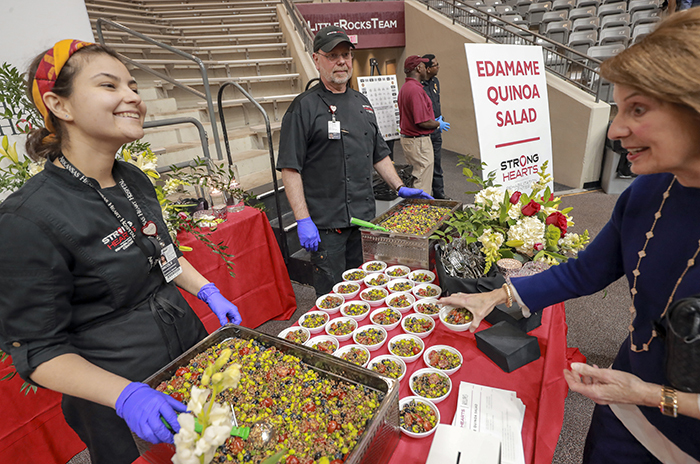 Top right photo: A Taste of Little Rock attendee samples edamame quinoa salad preapred by Arkansas Heart Hospital. 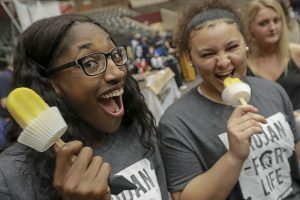 Above left: UA Little Rock student volunteers sample frozen treats from LePop, one of this year’s vendors at Taste of Little Rock.